You must be a member of the Istanbul Sociophiles Group to attend this activity. Would you like to join this group? If you are also a Sushi monster like me, then I am looking forward to see you in Karakoy for unlimited Sushi. The taste is really good! 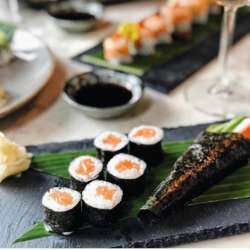 You will find a range of appetising options like tornado roll, sake teriyaki roll, California Roll, spicy Suzuki roll, dragon roll, Philadelphia roll, vegetarian tempura roll, tempura roll, Rainbow, salmon skin. I believe that you are not a “Happy-Clicker” otherwise I have to pay from my own pocket a penalty for each no-show-off! Thank you for your understanding!